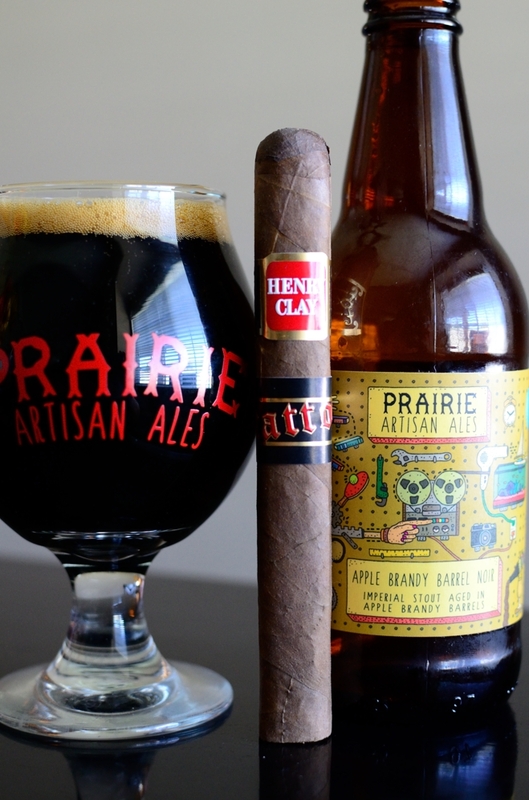 After celebrating our annual “Casatoberfest” at my place this weekend, I took Sunday off to rest, relax, and enjoy a Henry Clay Tattoo paired with a bottle of Prairie Artisan Ales’ Apple Brandy Noir. News blew up the cigar wire when Pete Johnson announced he’d be working together with Altadis USA creating a modified Henry Clay blend called the “Tattoo”. Pete has often talked about his love for the Henry Clay. It’s something he often enjoys smoking now, and throughout the years. I actually did a blind review of the standard Henry Clay (you can read that here) and I immediately thought “Tatuaje” so the inspiration is there for sure. Circling back the the Henry Clay Tattoo the cigar features a Connecticut Broadleaf 2010 wrapper, Dominican Republic 2010 binder, and filler tobacco from Dominican Republic and Nicaragua. 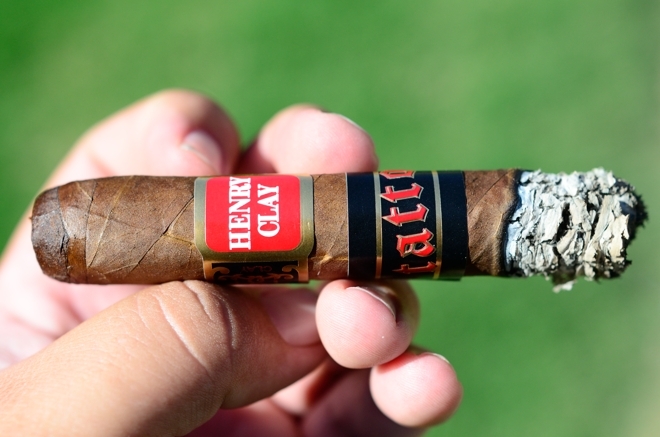 While Pete has always worked with the Garcia family to produce his cigars, the Henry Clay Tattoo is being produced by Altadis USA in the Dominican Republic. The Henry Clay Tattoo comes in a single 6 x 52 format which carries a priced tag of $9.50 per stick. The cigars come packaged in boxes of 20 with only 2,500 boxes released, so these will disappear fast (and in most cases already have). I picked up a few of these over from our friends at Cigar Hustler. Much like the standard Henry Clay, the Henry Clay Tattoo carries a very rough, rustic looking character. The wrapper a very splotchy medium to dark brown with lot of areas of a slight orange hue. The wrapper’s texture is very rough and toothy while it carries a good amount of oil which actually rubs off on my fingertips as I inspect the cigar. 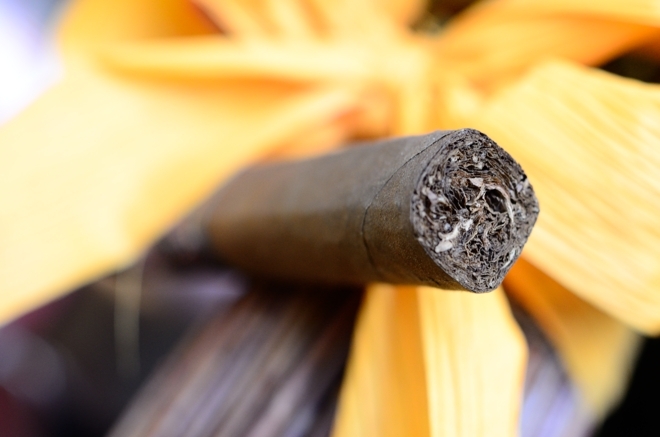 The wrapper is very hard and thick while the cigar is tightly packed with only a few softer areas around the foot. There are a few medium sized veins and webbing running through the tobacco leaf, but nothing too concerning. 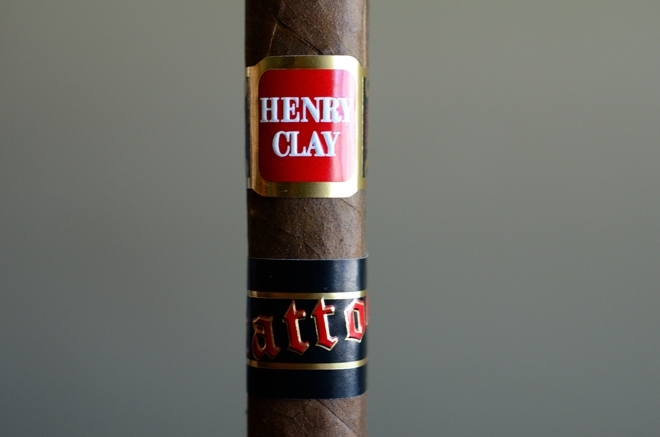 The Henry Clay Tattoo features of soft box press which leads up to an interested round, double cap with a thin little pig tail that is folded over on one side of the cigar. The cigar is polished off with the standard Henry Clay red, white, and gold band with a typeface updated and some interesting black accents on the side as well as a secondary black band with the word “Tattoo” spread across the front, and “Pete Johnson” printed lightly in the back. 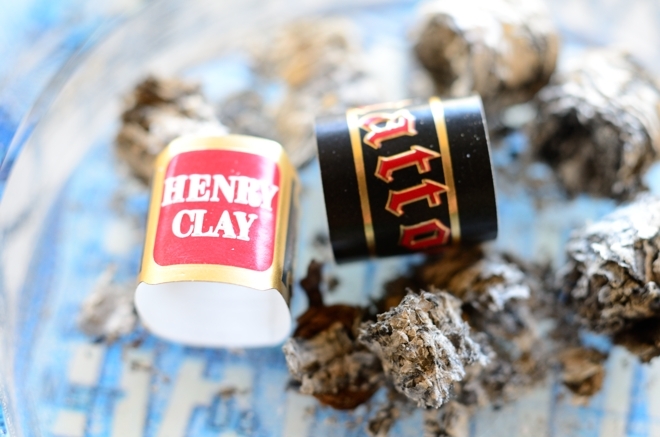 The wrapper on the Henry Clay Tattoo gives off strong sweetness, cedar, and spice aromas while the foot of the cigar is much more natural featuring some mild tobacco and grassiness. The cap cut very clean and easily using my Palio double bladed cutter. The cold draw produces some deep cedar, sweetness, spice, and fruit flavors. 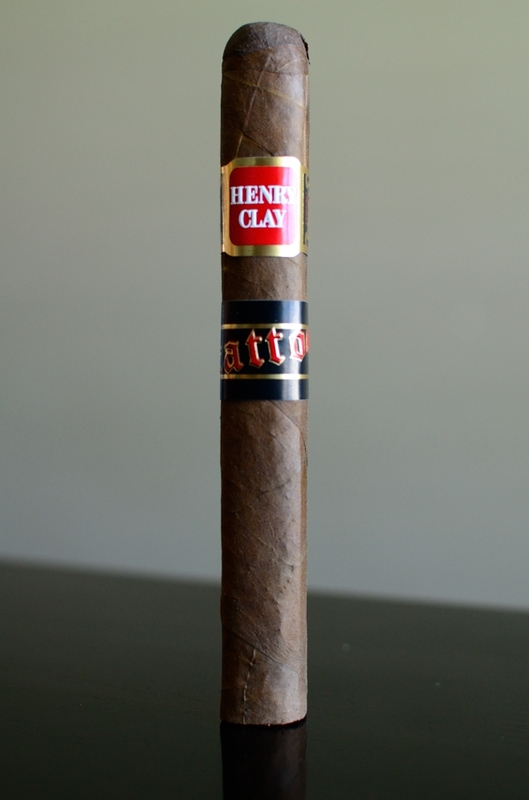 The Henry Clay Tattoo starts off with a nice subtly pepper punch which quickly fades into some deep cedar and oak, espresso, cherry, spice, and tartness which tends to linger on my lips and tongue for a good while after each puff. The draw was a bit tighter than I liked, and the cigar seemed to have a bit of trouble keeping lit through the first third. I didn’t have to re-light, but the burn was almost out each time I picked up the cigar cause me to have to puff a few times to get it going again. The burn line had some slight waves but for the most part burned pretty consistent while leaving behind a very tightly compacted trail of white and light gray ash which held on for an inch before giving way. Into the second third of the Henry Clay Tattoo and I am still having a tough time keeping this cigar lit. It has needed to be relit twice now, and has been on the verge of going out every time I pick it up. The flavor profile is rocking though. The cigar is now leading with some great chocolate, cherry, cedar, spice, and espresso with a decent amount of sweetness. Despite the burn issues I am really enjoying this cigar. The retrohale is a lot sharper than I anticipated coating my nasal passage with a ton of spice and pepper. As I stated before, keeping this cigar lit has been a bit of a mess but the burn line is pretty consistent as I close out the second third with no signs of nicotine. Into the final third of the Henry Clay Tattoo and the cigar is finally burning halfway decent. It’s still having a bit of a problem staying lit, but it’s not nearly as bad as it was through the first two thirds. The body has really began to ramp up as there was a great resurgence in the spice and pepper backed by the cedar, cherry, espresso and chocolate. The strength has really started to creep up on me again as the Tattoo has now ventured into the medium/full arena. It took me about an hour and forty five minutes to take the cigar down to the nub. The Henry Clay Tattoo finished with some very slight harshness (probably due to the burn issues), no extra heat, and just a slight nicotine kick. So let’s start with the good. 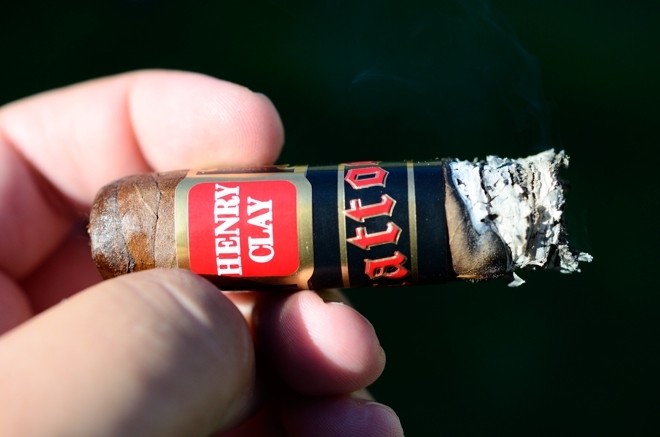 The Henry Clay Tattoo is a fantastic cigar. The flavors are both strong, and plentiful with a decently complex body. The Tattoo reminded me more of the original Henry Clay with nod to Tatuaje adding in a good amount of sweetness, rather than a Tatuaje paying homage to the Henry Clay. The format is awesome and very comfortable on both the mouth, and in hand, while the price point was reasonable. So there’s the good. The bad is that in both cigars I smoked leading up to this review I had some basic burn issues. This cigar just doesn’t want to stay lit. Maybe they are too young, maybe they were too moist, maybe they just don’t preform well. I really don’t know what caused it and the only thing that I can do is wait a while and see if I can re-visit this cigar and possibly give it a round two review after it’s had a bit more time to age and acclimate. Either way, this was a great cigar it just didn’t preform the way I’d like it too. Would I try it again? Well, I plan on it. Would I suggest it? If it wasn’t for my burn issues, I absolutely would. After typing all this up I went and peeked in on a few other’s thoughts on the Henry Clay Tattoo and I seem to be one of the only ones experiencing issues like this so it may just be the cigars I was sent with my order. That being said, I really do think this cigar is worth picking up. It’s not cheap, but it’s affordable, and the flavor profile alone is worth the coin. 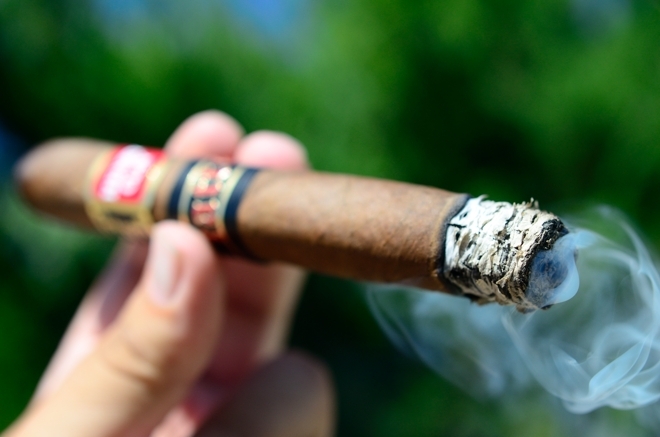 It’s very limited, so if you’re going to chase after this cigar you better get yours soon. Let’s just hope yours perform better than mine did. Yes, another Prairie Artisan Ales, who cares? They make some incredible beers that pair wonderfully with cigars and there is no shame in bringing them back into the pairing section time and time again. This week’s offering is their Apple Brandy Barrel Noir. This 12% Imperial stout is aged in Apple Brandy Barrels before bottle and shipped. The beer leads with a good amount of sweetness, chocolate, vanilla, apple, and malt with a heavy mouthfeel before finishing with more vanilla and chocolate, coffee, malt, and some slight booze with a malty apple aftertaste. I figured this beer would be a great pair with the Henry Clay Tattoo due to the apple, coffee, and chocolate flavors, and it was for sure. The apple added a bit more to the existing cherry flavors in the cigar as well. While this was a great pairing, I’d also consider matching this cigar up with a nice Belgian quad, a spicy dubbel, or some sweet bourbon. 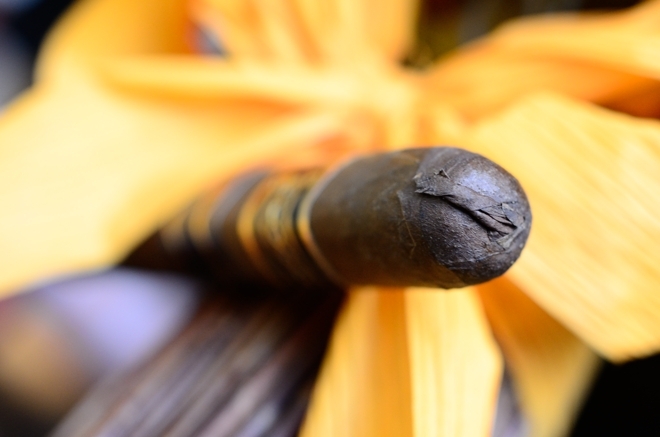 Your not the only one that has burn issues…I know a few others that couldn’t keep this cigar lit. The 5 pack I ordered came very moist and they shipped the same day the retailers got them…from what I have heard I wont be lighting any of mine til they have a full month humidor time and a few days dry boxed. Great review, until I read this I was thinking about smoking one.